People in Minneapolis have a wonderful can-do attitude when it comes to taking care of our homes. After all, we do spend a lot of time indoors! When it comes time to clean out the house or make upgrades and renovations, a rented dumpster may be one of the best choices you can make. Junk King has been known for years as the eco-friendly junk haulers that you call to pick things up. We started our 12-cubic-yard rented dumpster service to help with a different kind of project — those times when you’re creating a large amount of trash over the course of a weekend or several days. Junk King Minneapolis offers green junk disposal at low prices. We recycle or donates up to 60% of the junk we get from each rented dumpster. And we’re the first company to offer pay-per-use pricing! Still wondering if a rented dumpster is right for your needs? If your project falls into one of the categories below, call us at (612) 345-9058 or book online to save $30 when you schedule a rented dumpster in Minneapolis, St. Paul, Bloomington, Eden Prairie, or elsewhere in the Twin Cities area. 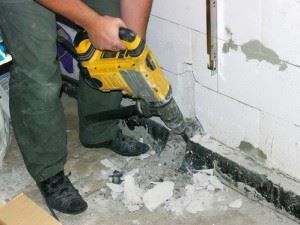 You’ve seen the TV shows where house flippers get to tear down walls and it looks fun, don’t you think? Try your hand at demolition and construction and use a rented dumpster to harness all the debris and junk! Your average weekend of lawn mowing and tree trimming might only fill a bunch of those yard waste bags. But what about the big landscaping renovations? The Junk King MINI dumpster has the perfect dimensions to hold landscaping waste when it’s too much for the paper bags. Whether you manage an apartment complex or just have one tenant in a duplex, sooner or later you will find yourself needing to empty out the junk that a renter has left behind. Unfortunately, it’s mostly garbage — nothing to auction off here. You could call us at Junk King Minneapolis for our full-service junk removal. But if you’d prefer to take your time and empty the apartment or house yourself, our MINI rented dumpster is the perfect solution. Do you have a room or storage space in your Minneapolis home that goes months without even being touched? Many people discover upon going through their attic or basement that they don’t actually want to keep anything in there at all! Check for photo albums and keepsakes, then consider dumping the rest in a rented dumpster. As a rule of thumb, if you haven’t thought about something in years, do you really need to keep it? Should You Use a Rented Dumpster for Spring Cleaning? For general cleaning projects, you might be wondering if a rented dumpster is really necessary. Junk King makes it easy to solve this dilemma. Our dumpster rentals are low-priced with an option to pay only for the space you use! We have a low minimum charge if you barely fill the dumpster. If you fill half the dumpster, you can save about 30% compared to a totally filled dumpster. With Junk King, less trash means a lower cost! So, those spring cleaning projects can use a rented dumpster and you won’t have to overpay. Take care of waste collection for your next home improvement or cleaning project with a rented dumpster in Minneapolis from the eco-friendly junk haulers at Junk King. Book online and save $30, or call (612) 345-9058 to ask for more info about our Minneapolis dumpster rentals! This entry was posted in Uncategorized and tagged Burnsville Junk Removal, Clear the Clutter, haul away minneapolis, Junk King Minneapolis, junk removal on July 11, 2017 by Julian Torres, "JT". Last updated July 28, 2017 .